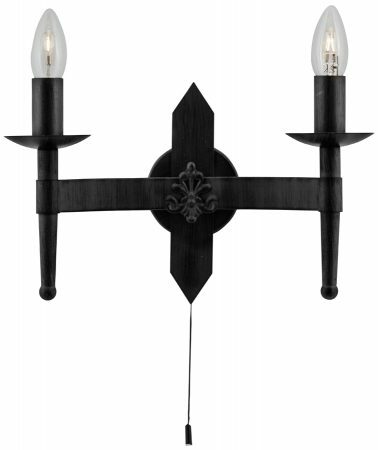 This Cartwheel 2 light wall bracket in black wrought iron is inspired by medieval chandeliers in castles from many centuries ago. Designed to light up your living spaces beautifully, the wrought iron effect fitting is old English style. The two candle tube lamps cast gentle lighting across the walls, so you can give your home a traditional look and cosy feel. A Gothic style twin wall light fashioned from matt black wrought iron effect steel holding two candlestick like sconces, with matching central spiked detail wall mount. A great piece to help create a heraldic touch in a medieval themed room, with the added benefit of a handy on / off pull cord switch below. Emitting 900 lumen’s this traditional wall light is sure to look great both by day or knight. Part of the Cartwheel Gothic lighting range.